The Gears of War universe isn't just about Delta Squad. 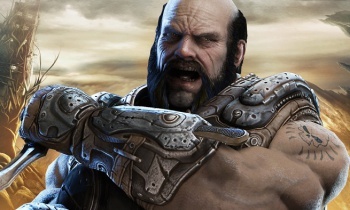 Every Gears of War fan knows who Marcus Fenix is, but not quite as many will be familiar with Michael Barrick, one of the characters from the spin-off comic book, Hollow. Those who don't know him are going to get the chance to meet him though, as he's going to appear in an upcoming piece of story DLC. In Hollow, Barrick is a former member of the Stranded - the people who didn't make it to the Jacinto Plateau when the COG burned the ground with its Hammer of Dawn counterattack - who signed up with the COG and became a Gear. Epic's design director Cliff Bleszinski said that the story DLC would not just be the Hollow comic turned into a game after speculation started on NeoGAF, thanks in part to Barrick's prominent position on the Gears 3 season pass artwork. Bleszinski said that there was content coming that wouldn't feature Marcus or any of the other members of Delta Squad, and hinted that we could see other characters from spin-off works as well. It's quite possible that the DLC will tell Barrick's story before he joined up with Delta Squad, when he was still part of the Echo Six team. The comic don't really go into a lot of detail about what happened to Echo Six, other than they were taken out by a Locust ambush. The story of a doomed squad isn't a bad idea for DLC, and it does explain why Barrick - the only survivor - is featured so prominently.